NASA is getting serious about its latest challenge to space-minded engineers: Design a solar-powered night rover for exploring other worlds. Unlike the solar-powered exploration vehicles being deployed on Mars, which have to bed down once the sun sets, the new rovers must function at a high level during the night as well as the day, NASA says. The contest comes with a prize of $1.5 million and is open to private companies, student teams and independent inventors. It is one of three additions to NASA's Centennial Challenges competitions to spur innovation and interest in space technology and exploration. Until now, rovers on the moon or Mars have operated almost exclusively during the day, reserving energy-draining nighttime tasks for once or twice a month.? "To do otherwise would require much larger batteries to operate during the nighttime hours. And that would have made the rovers heavier and ? 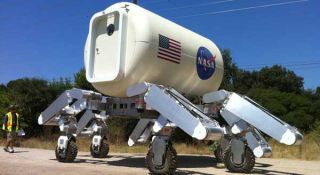 the launch costs more expensive," said Mars Exploration Rover researcher Matthew Keuneke at NASA's Jet Propulsion Laboratory in Pasadena, Calif. Even a small increase in the mass of exploration vehicles would makes their spaceship liftoffs more expensive by "tens of millions of dollars," Keuneke said. A rover better capable of storing solar energy for nighttime activities would immediately free up more energy for daytime uses such as photographic imaging, Keuneke said. Better energy storage could also allow rovers to conduct spectroscopic analysis (an effort that looks for chemical fingerprints of minerals) of rocks and samples every night, rather than once or twice a month. "Right now we pick or choose what objects to use with a spectrometer. If we were able to use it more frequently and with less impact, we may discover something that truly surprises us," Keuneke said. "The thing we frequently discover is that the things we don't think are important are actually the important things." As an example, he mentioned the Martian rover Spirit's 2007 discovery of silica channels indicative of past liquid water on Mars. Buried about 2 to 2.3 inches (5 to 6 cm) beneath the surface of ordinary terrain, the white trails were discovered only because a wheel of the rover broke and began churning up soil. ?? Barring the use of another fuel source, any innovation in the ability of rovers to operate in darkness will "almost certainly" be in its batteries, Keuneke said. The heart of the vehicle's solar energy system, batteries both store collected energy and regulate its usage into the steady stream appropriate for electronics. Without such mediating effects, a solar-powered rover would run into voltage faults and shut down whenever sunlight petered off beyond a critical point. ?? Most activities performed by the two ?Martian exploration rovers have used use power directly from solar rays, saving excess energy for darker times of day.? As darkness falls, each rover is designed to shut down, saving its energy for the critical task of keeping itself at a stable temperature during the Martian night, which can cause a rover to become as cold as minus 76 degrees Fahrenheit, or minus 60 degrees Celsius. The batteries become less efficient in the cold, subjecting the system to a "double hit," Keuneke said. Unless contest entrants simply make a tradeoff in mass to accommodate a larger battery, the successful design is likely to include a model for more efficient batteries, he said.